Mr. and Mrs. Alfred (Lady Wallace) Löwenstein, Brussels and London; by 1930. M. T. (Mrs. Richard) Warde, London (sale, London, Christie’s, 19 March 1965, lot 70, ill., as The Interrupted Supper). During the Napoleonic era, scenes of every day life fascinated collectors and the public. Louis-Léopold Boilly’s two delightful images of Parisian society, called Interrupted Supper, are painted with as much sophistication and finesse as a miniature. The first canvas depicts a young woman and her lover in a secret rendezvous. Her elderly protector is coming in the door, barely held at bay by her conspiring maid. In the canvas that follows, the old man angrily confronts his cheating mistress. As the women poke fun at him, the young paramour hides behind a wooden screen, cheeks still aglow from the amorous encounter. Toppled furniture and exaggerated features heighten the drama, revealing Boilly’s interest in caricature and the theater. 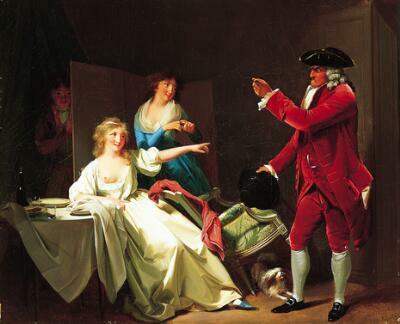 Boilly lavishes attention on the details of the scene, recalling the fashionable world of the Rococo, almost a century earlier. But the subject matter here -- a domestic drama played out in a bourgeois interior – looks back even further, to Dutch genre painting of the 1600s. The Dutch aesthetic is also evident in the meticulous brushwork and the painstaking depiction of fabrics and textures. Just look at the care the artist has taken to depict the woman’s lustrous silk gown… the man’s velvet suit… or the crisp table linens.